The 10 Best Christmas Movies & Giveaway! 1. It’s a Wonderful Life – This is probably one of my favorite movies of all time, regardless of its holiday theme. It’s relatable, heartwarming and overall a great story. If you haven’t seen it, do yourself a favor this year and watch it. 2. A Christmas Story – My all time favorite Christmas movie. Mostly because it’s so cheesy and hilarious. You’ll shoot your eye out! 3. The Original Christmas Classics: Rudolph, Santa Claus is Coming to Town, Frosty the Snowman, & The Little Drummer Boy – I always try to catch these when they air every year on TV, but since we don’t have cable this year, I’m tempted to pick this one up to keep. 4. White Christmas – This movie is a lot of fun. The music, the dancing. You really can’t beat a holiday musical. Plus, I always love the costumes! 5. Elf – This movie is just too much fun. I mean anyone who pours maple syrup on their spaghetti is cool in my book. 6. The Holiday – I had to stick a romantic chick flick on this list… it was between this or Love Actually, and my heart is just with this one. 7. Home Alone – I saw this for the first time last year… if you can believe that! I just didn’t grow up watching this one, but it’s a new fun favorite. 8. Christmas Vacation – Another new one for me – Dave introduced me to this cult classic last year. How I hadn’t seen it before is beyond me. 9. How the Grinch Stole Christmas – The book was a favorite growing up, so it only makes sense that the real life acted version is a yearly favorite. 10. Jingle All the Way – While this may not be on everyone’s list, this reminds me of the crazy hysteria of toys that happened in our youth. Beanie Babies and Furbys come to mind… I still think this movie is hysterical. And now for the even more fun part… a giveaway! This one’s a secret. As you may know, bloggers often acquire a lot of things. I personally obtain a lot of beauty products because of my tiny subscription box addiction and have ended up with doubles of a few products. I also occasionally see something when shopping that I think is cute… yet don’t need… so I pick it up to share with you for giveaways. Yeah, I’m weird. Anyways, what I’m getting at is that I’ve curated this box over time for one winner. It’s open internationally, but if it costs $50 to ship it to your location then I will offer a gift card instead. ;) Good luck! Which Christmas movies are at the top of your list? I’m a beauty product junkie, but especially love eye shadow. I’ll always appreciate jewelry accessories, or handmade items, or socks! Great picks, Mai! Good luck! It’s a Wonderful life is my favorite Christmas movie too and definitely up there with fave o fall time. Oooh good ideas! Good luck, Kenzie! Great picks – good luck, Heather! I love ANY Christmas movie. From this list, Home Alone is my favorite. i love mascara, lol, and primer of some sort? I would love to see some really great, moisturizing lip balm for this cold weather. Great suggestion, Catherine, and good luck! These are great picks! And it makes me extra happy when they are on Netflix. I’m pretty excited about your box. I love surprises! I’d like to see some really awesome clothes and awesome beauty products. You’ll have to watch it this year – pretty sure they usually play it on at least one of the cable channels on Christmas! ;) It’s a pretty good one. I’d love to see some lippies in the box! Don’t care what colors they are, I am sure they’re all beautiful shades! Beauty products. I would love new polishes! Ooh, something I haven’t tried before. A good nailpolish for winter! I would love to see some eyeshadow or skin care products! A soft cozy blanket scarf or infinity scarf! You nailed this list! Even jingle all the way is a great one, we watched it the other night! If Home Alone or Home Alone 2 is on, I HAVE to watch it. Haha seriously, it’s gotta be watched every year! Oh my goodness I love Elf and The Holiday! These are all great movies! As for the surprise box, I always love trying out new products, especially hair stuff! It would be exciting to get fun new hair product to mess around with! I think there will be some hair stuff included… but you didn’t hear it from me! ;) Good luck, Paige! I always love natural cosmetics!! I would love to see curly hair products and body lotion/butter. Thank you so much for offering such a wonderful giveaway! Of course, good luck Cindy! I love all theses movies. Glad you agree with the list, Ashley! I have a feeling I’d like anything you put in the package but makeup would be awesome! Thanks for this giveaway :) I love your movie picks too. Of course, thanks for entering Christine! I am not big on the holidays but I love The Holiday. I also love all the Friends Thanksgiving and Christmas episodes (I know they aren’t movies!). 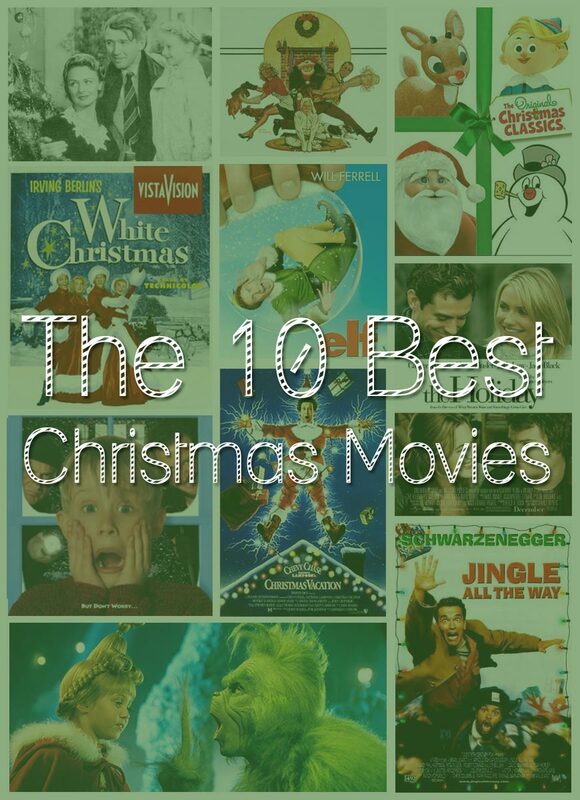 I totally agree with this list except that I would switch out Jingle all the Way with Holiday Inn. I love all of the claymation holiday classics! I HAVE to watch them every single year. lol! I’ve never seen The Holiday but everyone told me I really needed to so I just picked it up in the $5 bin at Walmart with The Family Stone (it’s one of those double feature ones). I’m really excited to see a new Christmas one this year too. And thank you for such an amazing giveaway! I would love to try out a new mascara or some fun eyeshadows! I love holiday movies! We just watched some of the classics last night as we put up our tree. I love Christmas movies. I think we are going to watch Love Actually later tonight. Elf is my favorite holiday movie. No I haven’t! Thanks for the recommendation, going to have to watch that this year! Christmas movies are just the best! I’d like to see nail polishes, skin care products or fashion accessories. Don’t judge me… but I’ve never seen White Christmas. It’s always been on my list but I just havent gotten around to it. Maybe this will be the year??? Lipstick, gloss, or hair products! I’d love to see anything, because I love surprises! Always love new beauty products to try out! Lately i’m into nail designs & fingernail polish…so i’d like to see fingernail polish, fimo canes, nail designs & how to do them. Good ideas! Good luck Traci! These are some awesome choices! I have seen at least 1/2 of them already! I like scarves, hair accessories, lip products, eye shadow, lotions. I am always excited to treat myself with fun socks, nail polish, and hair bands. Home alone and Christmas vacation are my faves! Love them!